The Evactron® ES and EP are vacuum appliances for removing trace carbon from SEMs (Scanning Electron Microscopes) and high vacuum chambers. They are affordable, easy to use, and require no adjustment to clean in any vacuum system equipped with a turbomolecular pump. No special gases are needed for operation, as they use room air. Simply install one on a vacuum chamber, apply vacuum, and switch on. "They just work." The E-Series Evactrons® have Turbo Plasma cleaning which has >60X faster cleaning rates than Evactrons® built before 2010. They operate at pressures below 30 mTorr (4 Pa or .04 Mbar) and the combination of longer mean free paths for the O radicals with less collision losses, more efficient power coupling for radical production, and 360° UV from flowing afterglow gives complete cleaning throughout the chamber. The ES and EP are so affordable. How does Electron Microscopy Sciences do it? ES and EP are designed as simple plasma cleaning appliances that cost less to build, as they contain only the basic features necessary for removing carbon from vacuum chambers. Turn it on to start – turn it off when finished cleaning – it is that easy. They are designed around a microprocessor that allows them to be under host computer command to set cleaning time and cycle cleanings. The RF power can also be adjusted downward if found to be too aggressive. They are created to give high performance carbon removal for most medium to small vacuum systems with one fixed set of conditions of RF power and air flow rate. These Evactron® models are not semiconductor process, etch or stripping tools. The RF components are the same as those used in our standard full featured Evactron® systems. The 20W RF generator is more reliable and efficient than larger RF generators and takes less space and cooling. The high efficiency hollow cathode electrode is easier to build than ICP sources. We have removed expensive valves, vacuum gauges, and MFCs from the simplified system. Reliability is built-in to minimize warranty and service cost. What is the difference between the ES and EP Evactron® models? The Evactron® ES model is made to be integrated with new SEMs to be commanded by the SEM computer so that it can only be operated when the high voltage is off to the electron gun and detectors, and the gun valve is closed. Oxygen cleaning plasma can destroy the electron gun by poisoning the emitter. Evactron® models have always provided safety to electron guns through the SEM interlock system. The Evactron® EP is meant for cleaning high vacuum chambers to remove carbon that may interfere with physics experiments or measurements. The EP has a plasma on/off switch on the front panel for the user. A user with little plasma cleaning knowledge beyond the need for a vacuum can easily use the EP to remove carbon from any source. It is very useful for removal of residual oils, and in new vacuum chambers to speed pump down. Carbon and water can build up in chambers that have been exposed to air. Evactron® cleaning removes oils, and UV from the plasma helps desorb water from the walls to speed pump down without baking. An optional computer interface allows for Computer commands and parameter feedback to the EP. How do the Evactron® ES and EP achieve high cleaning rates? The hollow cathode plasma source gives the plasma electrons a more mono-energetic energy profile that that of ICP type sources where the electron energy spread is high because of multiple collisions in the plasma. This is important because ICP plasma uses most of the power applied to create heat. This means that a Hollow cathode will be more efficient in producing oxygen radicals than ICP plasma. Keeping the power under 20W with a hollow cathode also avoids the ionization of N2. Nitrogen ions are very reactive with Oxygen radicals and destroy them in two body collisions, lowering the cleaning rate. The flow rate of air into the plasma is important both to maintain the quantity of Oxygen molecules to be excited and to lower the pressure in the chamber into the molecular flow range, allowing the operation of turbomolecular pumps at full speed while plasma cleaning. Research has shown that the ideal flow rate is 20 sccm ±5 sccm. 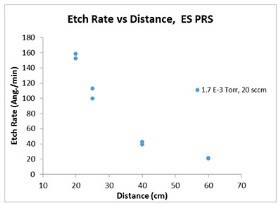 This flow rate maintains plasma ignition in all Evactron® PRS (plasma radical sources). Depending on turbomolecular pump speed and size, the pressure in the PRS will be between about 15 mTorr and 30 mTorr (2-4 Pa) and in the chamber near the turbo pump 1 mTorr to 22 mTorr. These pressures and these flow rates are tolerated by most turbomolecular pumps with active cooling (air or water) without overheating. Vacuum pressure: For high cleaning rates, it is also important to achieve the longer free paths found in molecular flow conditions. Two body collisions with diatomic species do not destroy the oxygen radicals used in the cleaning process, since the excess energy cannot be lost by allowed quantum transitions. Three body collisions allow excess energy to be lost as kinetic energy and thus remove oxygen excited species from the vacuum. The cleaning rate quickly drops with distance from the plasma source as the pressure rises. 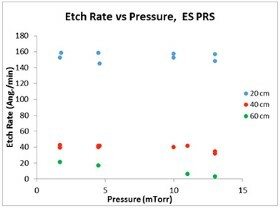 Experiments show that in chambers with less than 10 liters in volume, cleaning reaction rates rise rapidly until the pressure is below 30 mTorr (4 Pa). Below this pressure the cleaning rates vary more by chamber shape, location and distance from the plasma source, than by pressure. There tends to be a plateau between 10 and 30 mTorr where the cleaning rate is more a function of input gas flow than pressure. Pressure does affect the distribution of the active cleaning species coming from the plasma source. The cleaning species move by flow into the chamber. At higher pressures there is more scatter and cleaning is better on surfaces that are not in the line of sight of the plasma. 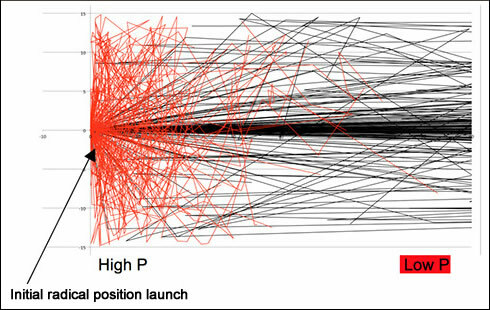 At lower pressures there are longer free paths and cleaning is concentrated on surfaces in the line of sight. Pressures below 1 mTorr cause spot cleaning in the chamber. Distance from Plasma: Cleaning rates strongly decrease with distance from the plasma and increase with declining pressure. Location of measurement and the geometry of the chamber also have strong influence on the result. Researchers are doing direct measurements and theoretical model calculations to fully understand these functions in the cleaning space. Can I start and operate the Evactron® ES or EP with my TurboMolecular pump at Full Speed? Yes. The low gas flow of only 20 sccm ±2 sccm does not overheat turbomolecular pumps that have active cooling. On passive cooled pumps, cleaning usually finishes in less than 5-10 minutes and overheating is avoided. What is "Pop" ignition and will my plasma always ignite? Pop ignition is a proprietary method (patent pending) that allows the RF power and air flow to be turned on in such a way that the plasma ignites every time. Pop ignition works even when the main chamber is initially at very high vacuum or below and very large turbo molecular pumps are used. It does require a vacuum under 1 Torr or 133 Pa to ignite. What is "Flowing Afterglow Cleaning"? When gas is flowed through a plasma, neutral metastables (excited neutral species) flow out of the charged particle containing plasma into a neutral region outside the plasma where they decay and create light (afterglow). Nitrogen metastables create a pink afterglow as they decay. The Oxygen radicals used in Evactron® cleaning create very little emission of light but they do accompany the Nitrogen metastables. The flowing afterglow in low pressure Evactron® cleaning is a marker for the presence of Oxygen radicals and cleaning activity on the nearby surfaces. How long should I clean? Low pressure mode cleaning should be limited to under 5 minutes and never more than 10 minutes to prevent oxidation of lubricants and other materials. Tests have shown that at 20 cm from the plasma sheath, cleaning rates are 10-60 times faster than Classic Evactron® cleaning at low vacuum (200-600 mTorr). Can I use the EP with just a roughing pump? With an oil filled roughing pump, the flow rate of 20 sccm of the EP and ES will perform classic mode Evactron® cleaning at pressures between 200 and 600 mTorr. While slower than "flowing afterglow cleaning", it is adequate for small chambers, such as the Softclean™ chamber, or others of less than 4 liters of volume. What size fittings do I need for mounting? The EP uses a KF 40 (NW40) clamp type fitting as standard. A CF 2.75 copper gasket fitting is an option. The ES is fitted with an SEM to Evactron® adapter flange to be mounted on an SEM port as chosen by the SEM manufacturer. Is the ES or EP Evactron® model bakeable? No. They are self-cleaning and don't need to be baked.